Your car's performance exhaust system needs to be working correctly to keep your car in top operating condition. Performance exhaust systems, whether they are aftermarket exhaust systems, custom exhaust systems or stock systems, help your vehicle in a variety of different ways. The exhaust system creates a more enjoyable driving experience by quieting the engine noise. It also reduces air pollution by controlling the emissions your vehicle releases. Having a properly operating catalytic converter is crucial to ensure that the exhaust system does not have leaks. Visit your local Meineke #49 in Charlotte, NC, today for more information about maintaining high-performance exhaust systems. 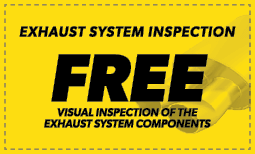 A question we are frequently asked at Meineke #49 in Charlotte, NC, is: "When do custom exhaust systems need inspections?" If you're already asking this question, you probably need one. You might be noticing odd symptoms such as louder volume, stronger fumes, or a new vibration. These are all signs of leaks and failing catalytic converters. Even if you're not noticing any of these symptoms, your car's performance exhaust system should be inspected if it's over 8 years old. Ensure that your car is in the greatest shape it can be in. Investing in muffler repairs will increase your car's longevity before the problems get any worse. If you start to notice a loss of power or a new vibration when driving your car, make sure to have the exhaust system inspected by a professional in Charlotte, NC. We are a premium muffler shop specializing in muffler repairs and high-performance exhaust systems. You may notice a new vibration when handling the steering wheel, touching foot pedals, or just sitting in the seat. This may be an indication that your car's engine is no longer operating at peak capacity. 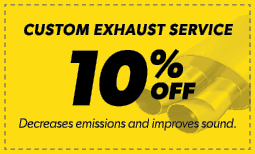 Our experts at Meineke #49 can provide a muffler repair cost estimate, perform muffler repairs and recommend custom exhaust systems for your car. Many drivers make the decision to get high performance exhaust systems. There are several upsides to getting an aftermarket exhaust system installed on your car. The main benefit is that they allow exhaust gases to be released more efficiently, which means more power goes to the engine. Another enjoyable aspect of custom exhaust systems is a more aggressive and deeper tone. Anyone can get a new performance exhaust system installed, but it can be an especially helpful investment for those who are already in the market for muffler repairs. Bring your car to Meineke #49 in Charlotte, NC, for any repairs or replacements you need for your exhaust system. When choosing a muffler shop you need to consider several things including location, your repair costs and the availability of custom exhaust systems. To keep your vehicle in great condition, it’s important for you to select a repair shop that has a reputation for high performance exhaust repairs and replacement. In Charlotte, NC, the best way to keep your repair costs down is to bring your vehicle to Meineke #49. Our experienced and certified technicians and our huge selection of performance exhaust systems for cars are the most affordable and practical solutions to all of your car repair needs. Make sure to visit us soon to get your vehicle ready for the road.